On Friday I walked down Tower Road on Cornell Campus in the shade of some magnificent oak trees that hover over the side walk on the the north side of the road. Acorns were crunching under my feet to remind me that from acorns mighty oak trees grow. I first walked down this sidewalk in the Fall of 1953 as a transfer student to Cornell from a disastrous year at Syracuse U. The oaks at that time were probably only six or so inches in diameter. However, now some of these trees 57 years later are over three feet in diameter. I like to think of these oaks as geezer trees. A metaphor for aging with magnificence. However, not all these trees are healthy. On the north side of the road the environmental condition is one of good soil, protection from the road salt. 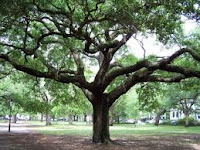 On the south side, the same age oaks are scraggly, and stunted with many dead limbs. They are simply struggling to survive. For years head in parking on the south side has ruined the soil with winter salt baths and compaction of the soil. It is a regrettable situation. So if these trees are a metaphor for aging into geezerhood perhaps it has a message about how to survive with honor. Geezers need a healthy environment that protects us from the ravages of bad elements. Over time if we let the bad stuff creep in, we will suffer just like the oaks in the salt bath. Meanwhile, if we have cultivated good life and surrounded ourselves with supportive family, followed a healthy diet and life style we can reign like the mighty oaks. And we will enjoy the success of the acorns we produced developing into human trees making a difference in the future society.